Michigan has a total of seven medical schools. Most are focused on bringing more family physicians into the workforce along with addressing the physician shortage in the state. Three of the medical schools, (University of Michigan Medical School, Wayne State University School of Medicine, and Michigan State Medical School) are ranked among the top 100 medical schools in the country for research by U.S. News and World Report. 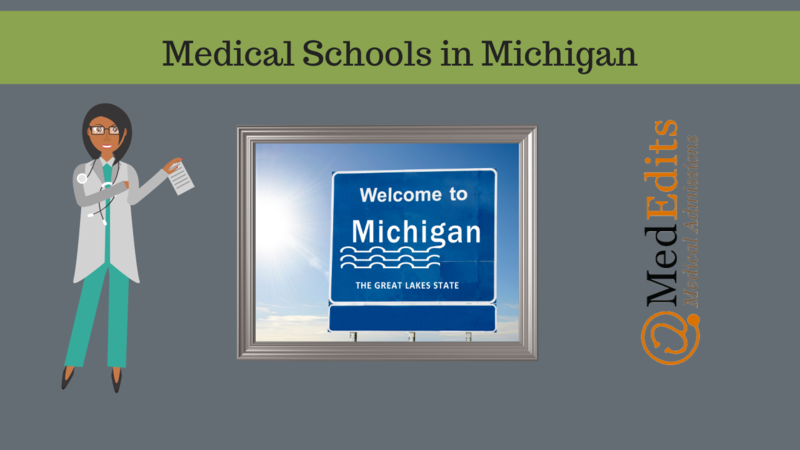 Like all medical schools, medical schools in Michigan are also competitive. Moreover, out-of-state students face a greater challenge because some medical schools in Michigan accept a greater percentage of in-state students. Want to know how to be a more competitive medical school applicant? Sign up for a free consultation. When applying to medical school, it is important to determine if your application is competitive. While researching medical schools, it is essential that you pay attention to the average MCAT scores and GPAs of accepted students, and acceptance rates. If you are looking into medical schools in Michigan and are an out-of-state applicant, it is imperative that you also evaluate the percentage of the entering class that is comprised of in-state students. Most medical schools in Michigan seem to prioritize in-state applicants, which can make it more difficult for out-of-state applicants to be accepted into one of the seven medical schools. So, how difficult is it to get accepted to a Michigan medical school? Let’s review the data. Below are the average MCAT scores and GPAs, interview rates for in state and out of state applicants, acceptance rates, percent of entering class that is in state, and tuition for all medical schools in Michigan. How can you increase your chances of getting accepted to a Michigan medical school? Regardless of whether you are an in-state or out-of-state applicant, getting into medical school is difficult. You have to determine if your GPA and MCAT score are competitive enough, your experiences and background as expressed in your application entries and personal statement, and letters of reference, to get you invited for an interview. For medical schools in Michigan, this is especially important for out-of-state applicants. Many Michigan medical schools are focused on addressing the shortage of physicians in their state, and therefore prioritize in-state applicants. However, it is not impossible to be accepted into a medical school in Michigan as an out-of-state student. If, along with a competitive GPA and MCAT score, you have a strong passion for family medicine, medical schools in Michigan might be a good fit for you. The exception to this rule is The University of Michigan which is one of the most desirable medical schools in the country. Keep in mind that statistics just tell one part of the narrative. Most medical schools look for more than just if particular numbers have been met. As a medical school applicant, it is very easy to become overwhelmed with the statistics and the numbers thrown on various sites. Undoubtedly, MCAT scores and GPAs are incredibly important aspects of your application. But, if your numbers vary slightly, there is no need to be distressed. However, it is also important that you remain realistic. If you have a low GPA and MCAT score, you might want to consider boosting the two before applying to medical schools. If, you have determined that you do have a competitive GPA and MCAT score, it is important that you focus on your personal statement and application entries to distinguish yourself in the initial phase of the application process. Medical schools, including those in Michigan, want a cohort of students that will make incredible future physicians and will contribute to the medical school community. For medical schools in Michigan, you need to determine whether your ideals align with theirs and if (as an out-of-state applicant) the school(s) are worth your time and effort. Realistically, as an out-of-state applicant, it will be more difficult for you to be accepted. So, you should be pretty certain that you want to attend a medical school in Michigan. If you do determine that you want to apply, then you must make sure that your application is competitive in all regards. If it is not, speak to your advisor(s) and mentor(s) and determine how you can improve your application. Sometimes, taking a gap year is the only solution. Essentially, you need to figure out what is best for your application and which medical school is right for you.